This is an introductory camel trek for everyone from families to experienced walkers and campers. Everyone has their own camel so can chose to walk or ride. Most people will chose a mix and will, for example, walk for an hour, then ride for an hour. This is a wonderful desert experience if you are comfortable camping. We are completely alone and isolated for most of the time. Mobile phones don't work either. 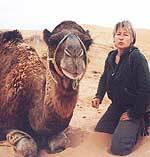 * 5 days with your own camel, riding or walking. * 6 nights bivouac in the desert, cooking fresh bread on open fires and living outside. * the contact with our camel drivers and cooks. * 2 nights in Djerba in a 4* hotel with huge swimming pools - The Vincci Djerba Resort. Fly to Djerba (Jerba) to arrive by early afternoon - 1400h at the latest. Meet our 4WD vehicles and drive to KSAR GHILANE to spend our first night in the desert just outside at ZEMLA. (4hrs of driving, inc ferry). Day 2 Meet our Marzougui guides and camel drivers. Day 3 Gour el Mida: We pass the only local well, with large herds of camels and goats drinking thirstily. Then we climb the mountain - Gour el Mida - for views for miles. Day 4 Ras el Oudhif: we walk along this high plateau before rejoining the endless dunes. Day 5 Houdh el Arfaj: an area where we may see gazelles, foxes and big lizards (Varan). Day 6 Our last day crossing the desert brings us to our bivouac at Rachem. Day 7 Troglodyte experience: Out of the desert and transfer by 4WD towards Chénini. We visit a Berber underground village and can then walk (or drive) to Relais Kenza, an underground / troglodyte guest-house where we stay the night. (lunch, evening meal & breakfast). 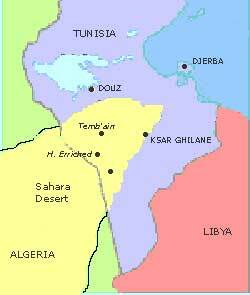 Visit the oasis towns of Tatouine and Ksar Ouled Soltane in the afternoon..
Day 8 Transfer by 4WD to Djerba. (3hrs of driving + ferry). 2 nights in the 4* Vincci Djerba Resort. Day 9 Free day in Djerba, to visit the souk, relax by the pool, and swim in the Mediterranean. Day 10 Airport transfer for your onward/return flight from Djerba. FOOD: We eat fresh-cooked bread (cooked 2 or 3 times a day), healthy salads at midday and evening meals of pasta, couscous or meat and vegetable stews. There is coffee and tea at mealtimes and unlimited bottled water at all times. EVENINGS: are spent relaxing, talking, learning Arabic, local songs and music (our guides carry drums and flutes), and dancing. And eating a delicious meal. WASHING: There is a very limited amount of water for eg handwashing. Ask for our kit list for more information. TRAVEL: We take care of everything Djerba - Djerba (sometimes spelt "JERBA" on english websites). You are responsible for arranging your own travel to/from Djerba, to arrive in time for the transfer. 4WD transfers: We use modern 4WD vehicles for all transfers and to get as far as possible into the "real" desert. We avoid walking in the stony desert as much as possible. MARZOUGUI GUIDES: Our nomad guides have become my personal friends. They are extremely welcoming and gentle with all travellers. They know the desert like the back of their hand and are happy to share their expertise at living off the land. They speak Arabic, and some French and will be delighted to teach you Arabic. OUR GUIDES: at least one of us will be with you throughout the adventure. We manage the camel drivers and make sure you have everything you need. DATES: Easter >> email Adventure treks for more information. 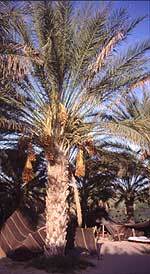 Date palms - with the dates ripe for eating, straight from the tree. We sleep under the stars, or in a large communal Bedouin tent. Thick foam mattresses and blankets are provided, you just need a 3-season sleeping bag. OR ride our own Arabian camel. Remember: These treks are graded B; they are in the heat and soft sand. Camel riding is comfortable, once you get the hang of it! We camp out each night and eat together from a single bowl. There are no toilets and limited washing facilities - wet wipes are great. dates: Easter (10 days, 9 nights) : price 790€ person. 2 people sharing a twin room with shower in a 4-star hotel for 2 nights and in an underground guest-house for 1 night. 6 nights camping in the desert. A single room supplement of about 30€ is no problem if you prefer. Your own Arabian camel, all accomodation, all breakfasts, lunches (days 2-9), all evening meals and all transport & transfers. Flights to Djerba. All alcoholic drinks, insurance, any medical costs, postcards and presents. Lunches on days 1 & 10. 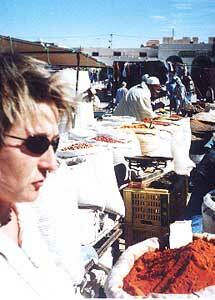 Travel into Djerba for shopping etc on day 9. >For international flights to Tunisia look at Air Tunis www.tunisair.com.tn once they are online. >For domestic flights between eg Tunis and Djerba, look at Air Tunis www.tunisair.com.tn then ask us to book this for you - our agents in Tunisia can book this much easier than can you or your travel agent. DOUZ: £30 per person, single supplement £15. DJERBA: £30 per person, single supplement £15. KSAR GHILANE: £50 per person, single supplement £30.